Harley’s been manipulated by False Face and Hugo Strange, but she’s through taking it lying down. The first order of business making sure the Isle of Coney is safe and secure. The Penguin seems more determined that ever to pull it from her grasp, going so far as to enlist the help of Mr. Freeze. But Freeze and the Penguin aren’t Coney’s only problem. Killer Croc is joining the fray as well. 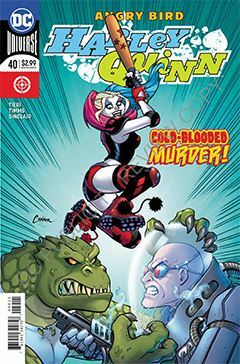 Meanwhile, Harley’s pal Eggy is being held by bat-villain Egghead, once known as “the world’s smartest criminal.” Eggs-actly what he has up his sleeve for Harley’s hen-fruit henchman is unknown, but in Harley’s world, crazy, like paradise, doesn’t need a reason. Will Eggy crack before he can be rescued? Can Harley’s pals scramble in time before it all over? Easy, reader – omelette you be the judge. There was a moment that took me out of the book. The dialogue didn’t quite match the panel action, as if what I was reading took place AFTER what I was seeing. It’s impossible for me to guess if that’s an art direction flub on Tieri’s part, a storytelling misstep by John Timms, or poor editing by Chris Conroy. Or maybe it’s just one of those evil little gremlins that pop up from time to time. It happens. Regardless, it was a solid chapter. Harley Quinn is less about a henchgirl-turned-anti-hero. It seems to be a conduit for seldom-used characters from other corners of the DCU. That's not necessarily a bad thing, because it is less beholden to the continuity of high-profile characters like the Bat-cast. It opens the door to new ideas and new interpretations, and that's better for everybody.